They did their part last week, securing a winning regular season season for the first time since 2011. A few minutes later, another game in the Class 3A Greater St. Helens League finished, bringing more good news to the Prairie Falcons. No need for any tiebreaker this season. The Falcons were going to the playoffs. For the first time since 2011. At school and on social media, Prairie fans are making a big deal of this football season. Rightfully so, the coach says. “The vibe has been pretty dang cool. The amount of congratulations these kids are getting is pretty impressive. It is amazing how many people have reached out,” Peck said. “It’s a great time to be a Falcon,” he added. 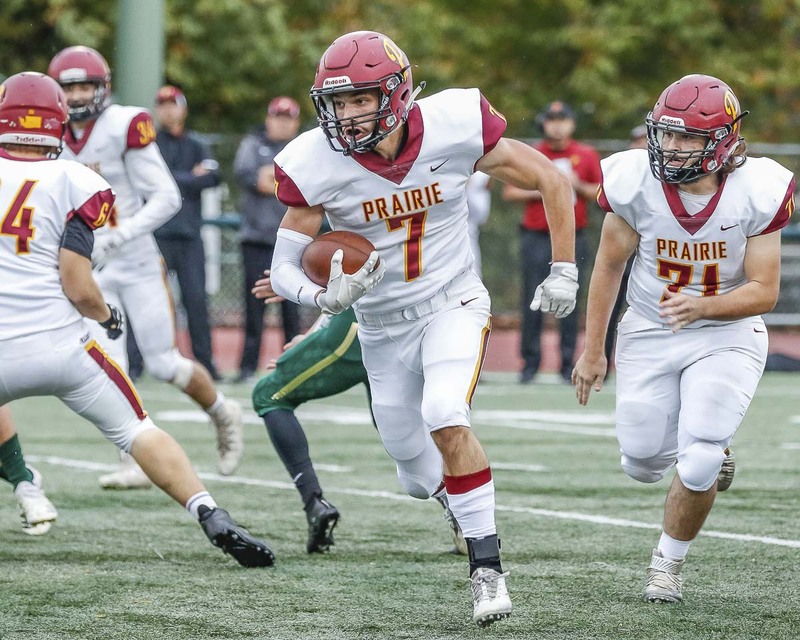 Prairie is one of nine teams in our coverage area that qualified for the postseason this season, which begins Friday. Today, ClarkCountyToday.com takes a look at the history of all nine teams. Oh, and Paul Valencia, longtime sportswriter in the county, will give his opinion on the best playoff moment for each of those teams. Schedules are for Week 10 playoff games — state preliminary round for Classes 4A and 3A and district playoff games for 2A and 1A. They mean the same, though. Win and go to the state playoffs put on by the Washington Interscholastic Activities Association. Lose and season is done. The winners will find out their opponents for the first round of state on Sunday, when seeding committees from each classification finalize those seeds. Playoff history: This is the ninth appearance since the school opened in the fall of 2007. The Titans are 13-8. They are 7-1 in Week 10 games to advance to state. Last appearance: Union reached the Class 4A state playoffs last year, losing in the first round to Sumner. Best moment: Union made it to the Class 3A state championship game in its second year — and first playoff appearance — back in 2008, and reached the semifinals in 2009. For one game, though, it’s got to be the 2008 quarterfinals when the Titans blocked a field goal in the final minute and returned it for the winning touchdown at McKenzie Stadium. Playoff history: This is the 17th appearance for the Papermakers, who made their first postseason in 2001. The Papermakers are 24-15. This is the program’s 16th consecutive postseason appearance. Camas is 11-5 in Week 10 games. The team has reached state — at least the round of 16 — in each of the past eight seasons. Last appearance: Camas reached the Class 4A state playoffs last year, losing in the first round to Central Valley. Best moment: That is a lot of history, of course, and a lot of playoff runs. But there is only one choice here. In 2016, the Papermakers went 14-0, finishing the perfect season with a 24-14 victory over Richland in the Tacoma Dome for the Class 4A state championship. Playoff history: This is the program’s 14th postseason appearance. The Storm reached the playoffs 12 consecutive seasons from 2005 through 2016. Skyview is 17-13 in the playoffs. The Storm are 9-4 in Week 10 games. Last appearance: Reached the Class 4A state semifinals in 2016. The 4A GSHL had two of the semifinalists that year (along with eventual state champion Camas). Best moment: The Storm opened the 2011 season with back-to-back losses, then won 11 in a row. Skyview beat Lake Stevens 38-14 in the semifinals at the Tacoma Dome, advancing to the program’s first state championship game. Playoff history: This is Mountain View’s 14th playoff appearance. Mountain View has made it to state eight times, going 8-5 in Week 10 games. Last appearance: Mountain View made it to the state round of 16 last year and lost to Peninsula. Best moment: The 2001 state quarterfinal game (10-7 win over Wilson) was a closer, more thrilling game, but we’ll go with the 2002 quarterfinal game, a 40-14 win over Kentridge. That gave Mountain View back-to-back appearances in the semifinals, believed to be a first for a Clark County program. Prairie Falcons (5-4) vs. Lincoln (7-2), 7 p.m Friday at Lincoln Bowl in Tacoma. Playoff history: This is Prairie’s ninth appearance in the postseason and first since 2011. The Falcons have three wins in state playoff games, all coming before Week 10 preliminary round games became the norm. Prairie is 4-8 in playoff games, 1-3 in Week 10 playoff games. Last appearance: Lost to Meadowdale in Week 10 of 2011, finishing that season 6-4 overall. Best moment: Let’s go all the way back to 1985. First state football playoff appearance for the Falcons was a win, a 13-6 victory over Lakeside of Seattle. Hockinson Hawks (8-0) vs. W.F. West (5-4), 7 p.m. Friday at Hockinson High School or Battle Ground High school. 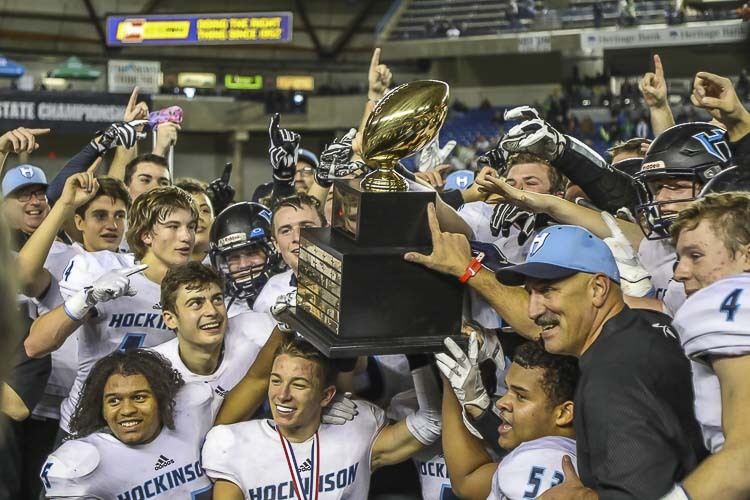 Playoff history: This is Hockinson’s 11th appearance since first making the postseason in 2006. Hockinson has a 9-9 playoff record, and is on a five-game postseason winning streak after winning the state championship last season. The Hawks are 3-7 in Week 10 games. They lost their first six Week 10 games before becoming the powerhouse they are today. Last appearance: Last year, the Hawks rolled to a perfect season, winning the Class 2A state championship. Best moment: Have to go with the state title game — Hockinson’s 35-22 win over Tumwater at the Tacoma Dome — but it’s close. The team’s first playoff win in school history in 2014 was remarkable as well, beating Black Hills 24-21 after trailing by 21 in the fourth quarter. Playoff history: A very long history, with the first official state playoff game for the program coming back in 1979. (Also, before playoffs, Woodland was reportedly voted small-school state champion after a perfect season in 1972.) This will be Woodland’s 21st appearance since the WIAA started having football playoffs. The Beavers are 9-20 in playoff games. By our number-crunching, we have the Beavers at 4-12 in Week 10 winner-to-state games. Last appearance: Woodland lost in the Week 10 district playoff 38-35 to W.F. West last year. Best moment: Beat Cashmere in triple-overtime in the 1982 Class A state semifinals. Playoff history: This is the 25th playoff appearance for the Chieftains, the most by any team in the region. First one was way back in 1975, two years after the WIAA started a playoff system for football. Columbia River is 17-24 in playoff games, including 10-4 in Week 10 winner-to-state games. Last appearance: Columbia River lost to Black Hills 14-10 last year in Week 10. Best moment: A 24-7 road win in Ellensburg in 2002 kept the Chieftains undefeated that year and advanced them to the program’s first final four appearance. Last appearance: La Center lost to Meridian 34-14 in the Class 1A state semifinals last year. Best moment: Another team with a lot of playoff memories, but let’s go with the 41-35 win over Cascade Christian last year in the quarterfinals. Tied at 7 going into the fourth quarter, the teams combined for 62 points in the final quarter plus three overtimes. The win gave La Center back-to-back appearances in the semifinals.